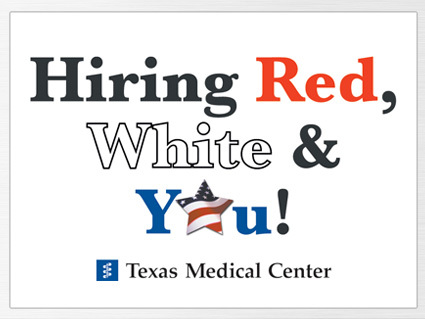 The Texas Medical Center (TMC) and its member institutions will host a job fair focused on hiring veterans and spouses of deceased veterans on Thursday, April 24, at the Hornberger Conference Center, under the “Hiring Red, White & You!” program. The initiative will take place from 9 a.m. to 1 p.m., and will make new and vacant jobs available to applicants in departments such as laboratory technology, administrative support, logistics and transportation, nursing, security, education, food service, research, information technology, finance and maintenance. “Members of the Texas Medical Center have acknowledged the challenges facing our veterans and have come together to offer these qualified applicants job opportunities,” said the committee chair of the TMC’s “Hiring Red, White & You!” program and director of talent acquisition and recruitment strategies at Houston Methodist, Willie French. Applications from prospective workers will be collected and delivered to representatives from close to a dozen biotech and life sciences institutions, who will also conduct on-site interviews at the event. “Every American owes an immeasurable debt of gratitude to our veterans and their families. We hope that we can begin to repay this debt through our veterans hiring program,” added French. The TMC’s member institutions, including its various clinics, universities, hospitals, and research centers, employ more than 100,000 people, but, at any given moment throughout the year, any of these institutions can have open job opportunities for qualified people who wants a health care career. The event seeks to bring together the employment needs of those associated with veterans with job vacancies that need filling at TMC. “Our service members who fight to protect our freedoms abroad shouldn’t have to fight for jobs when they return home,” said John Holcomb, retired Army colonel, co-founder of the program and a trauma surgeon at The University of Texas Health Science Center at Houston Medical School and the Memorial Hermann Texas Trauma Institute. The Texas Medical Center is an internationally recognized medical center and the largest complex of that kind in the world. Launched in 2012, the TMC’s “Hiring Red, White & You!” program has worked to hire more than 1,000 veterans.